I’m not sure I actually need words this time, the beautiful floral displays created by Gee at Bloom & Burn do all the talking. I was so glad to be working with him for this beautiful halloween post. I came back from Turkey after enjoying the hot sun and arrived to see London in the throws of Autumn, I knew I had to embrace the season with some Fall styling. This post features a few display ideas which will be perfect if you’re not a fan of the shop bought spooky decorations. I hope you love them as much as I do. The first halloween display idea features an incredible pampas grass wreath that Gee made. He wired the pamapas in a slight spiral shape onto a wire frame and added in rusty jasmine foliage and other dried glasses and flowers for a pop of warm colour. Gee created a posey of peach and purple flowers to sit in one of my copper cups and I scattered Autumnal fruit and veg around the sideboard for a relaxed harvest feel. We also had two small bud vases either side for even more floral goodness, I love how the dark tones in some of the blooms contrast with the orange. Gee focussed on dahlias and a range of dried flowers and grasses for a beautiful but dead look. I gathered together some very small apples from near my home as well as wonky pears and a range of pumpkins to place on the sideboard. I also use black tall candles to hint at at spooky halloween look as well as an owl ornament and a really usual jug which features a funny little fellow! This look is all about that casual “un done” look. 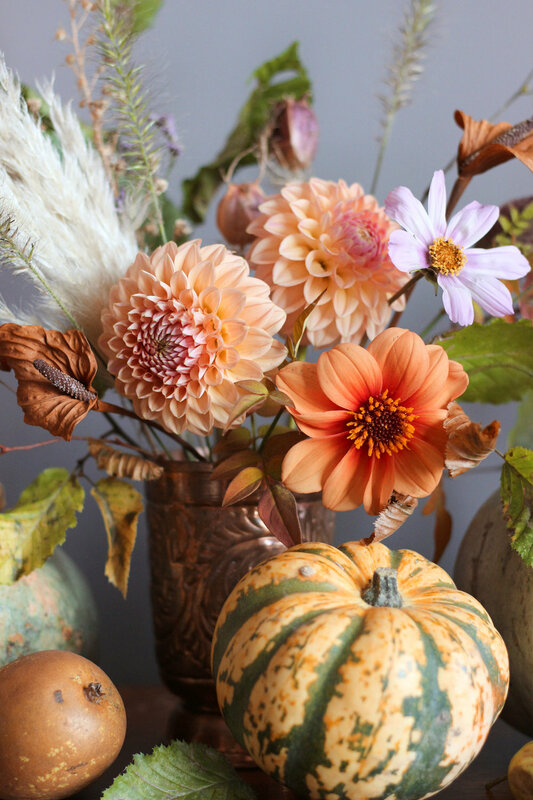 Collect things that remind you of the autumn season and place them around your vase of flowers, keeping it all a bit haphazard. If you have any usual or weird objects feel free to add them too. The second look as a lot softer and doesn’t really have that traditional spooky feeling. This display is perfect if you’re looking to celebrate the Autumnal season as a whole rather than just halloween. 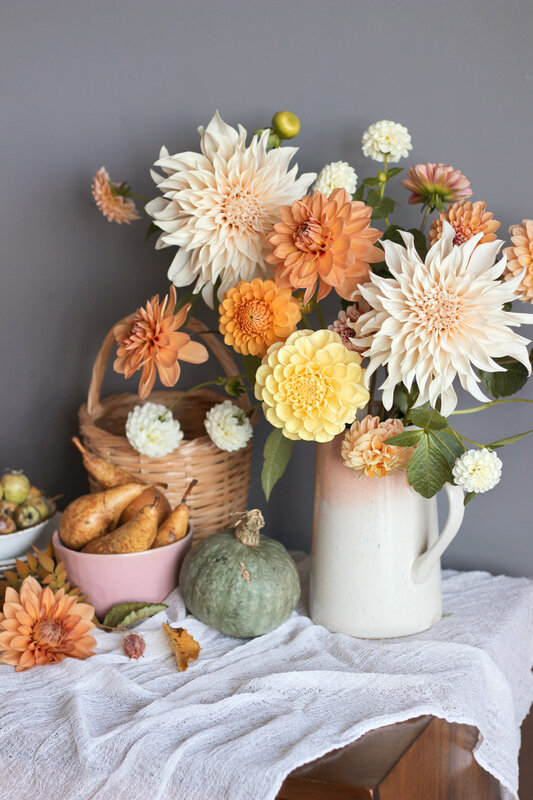 This arrangement is totally dreamy, if you’re a fan of dahlias you’ll love this one! The Cafe au Lait dahlias really stole the show with this one, we were so lucky that Gee managed to source some beautiful blooms from the Wolf Lane cutting garden that day. Gee created a ball of copper chicken wire that we hung from the ceiling using command strips and fishing wire, this served as the base for the chandelier. Gee added in the semi dried foliage and then popped in the blooms one by one. The chicken wire acts as a really simple structure that holds the flowers in place really well. We recommend using floral test tubes with water to ensure that your flowers last. Just in case you’re reading this post and thinking “I could never do all that” I wanted to show you this last photo. After Gee left I put the stem vases and sweet posey arrangement to good use and knocked together this very quick Halloween decor. This quick snap of my living room goes to show that you really don’t have to put in a tonne of effort (but I have to admit that creating something impressive has it’s benefits too!). I really hope you loved reading this autumnal / Halloween display inspiration post. Have a spooky but beautiful October!